Sen. Amy Klobuchar's first interview after declaring her run will be on "GMA." The middle of the country is getting some rare 2020 attention. The latest entry into the presidential race, Sen. Amy Klobuchar, would hardly have registered as a centrist or a moderate in any previous election cycle. But as a Midwesterner who has won three blowout statewide races with strong showings in rural Minnesota, and with a reputation as a pragmatist in the Senate, Klobuchar brings proven vote-getting from a part of the country that will actually determine the next election. She'll talk about her vision for the race Monday morning in her first interview since declaring her candidacy, on ABC's "Good Morning America." 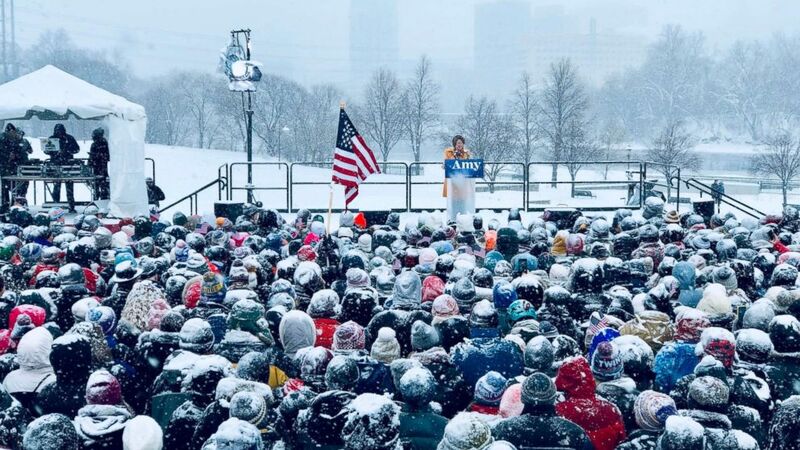 (Karem Yucel/AFP/Getty Images) Senator Amy Klobuchar (D-MN) announces her candidacy for president, Feb. 10, 2019, in Minneapolis. The race is already filled with candidates from states President Donald Trump has no realistic chance of winning, such as California, New York, New Jersey and Massachusetts, and states he has little realistic chance of losing, such as Texas and Indiana. Hillary Clinton got 46.4 percent of the vote in Minnesota in 2016, edging Trump out by just 1.5 points. She lost neighboring Wisconsin and Iowa, and nearby Michigan. The Democratic Party nationally is moving distinctly to the left on health care, taxes and protecting the environment. The new House majority in Washington is dominated by coastal liberals, who are helping push the 2020 contenders in a direction they were going anyway. Between Klobuchar and the possible candidacy of Ohio Sen. Sherrod Brown, Democrats from the middle of the country will have a chance to be heard as well. Congress has just this week to agree on a funding package to avoid another partial government shutdown. Over the weekend, negotiators on both sides pointed fingers across and claimed the opposition was moving the goal posts. 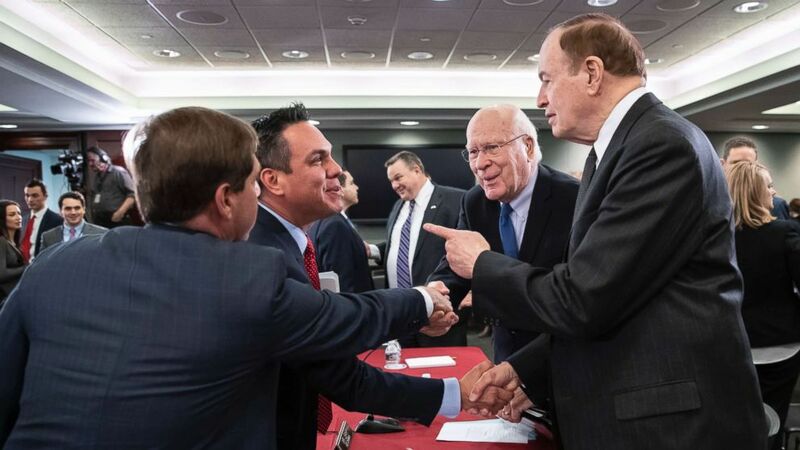 (J. Scott Applewhite/AP) Rep. Chuck Fleischmann, R-Tenn., Rep. Pete Aguilar, D-Calif., Sen. Jon Tester, D-Mont., Sen. Patrick Leahy, D-Vt., and Sen. Richard Shelby, R-Ala. greet each other as the bipartisan group of House and Senate bargainers finished their first meeting to craft a border security compromise in hope of avoiding another government shutdown, at the Capitol, Jan. 30, 2019. Rep. John Yarmuth, the Democratic chairman of the House budget committee, told ABC News' George Stephanopoulos that Secretary of Homeland Security Kirstjen Nielsen should come to the Hill and lay out for the members of Congress what exactly they would be buying if they gave the administration more money for border spending. As Denver public school teachers go on strike, maybe there's a lesson for Washington. Teachers across the country have been pretty successful, as of late, by making clear to the public their demands and how exactly to fund them. Beto O'Rourke's cross-country road trip cast him as a man lost in the wilderness after a bitter political defeat. But when the former Texas congressman steps out Monday in his hometown of El Paso, right as Trump is set to hold his first campaign rally of 2019, it will be impossible not to see him as what so many expect him to become: a presidential contender. 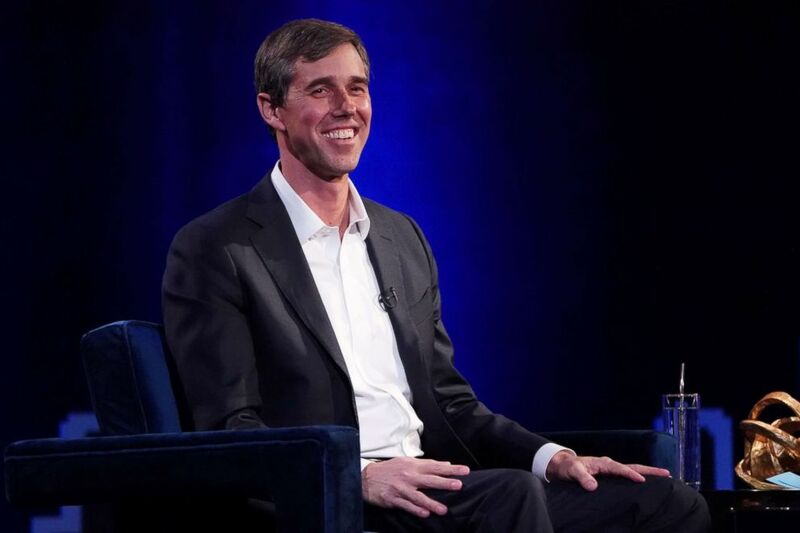 (Carlo Allegri/Reuters) Beto O'Rourke speaks to Oprah Winfrey on stage during a taping of her TV show in the Manhattan borough of New York, New York, Feb. 5, 2019. O'Rourke will speak Monday at a "March for Truth," rally, tweeting over the weekend, "The eyes of the country are on El Paso." While Trump's border security pitch and the looming deadline for a funding deal will dominate much of the discussion this week, the visit also represents a direct challenge from Trump to a man he knows could realistically be the Democrat trying to deny him a second term. 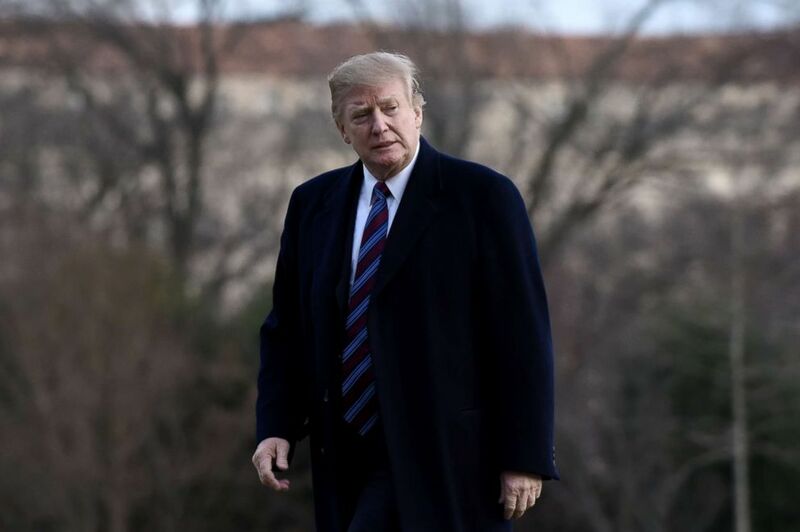 (Olivier Douliery-Pool/Getty Images) President Donald Trump returns to the White House after receiving his annual physical exam at Walter Reed National Military Medical Center, Feb. 8, 2019. Presidential candidate Sen. Amy Klobuchar, D-Minn., will appear on "Good Morning America." Presidential candidate Sen. Cory Booker, D-N.J., will attend the South Carolina Rise Student Forum at Morris College in Sumter, South Carolina, at 9:30 a.m.
Presidential candidate and former U.S. Rep. John Delaney will open a campaign office in Manchester, New Hampshire, at 6:30 p.m.
WMUR-TV, the ABC affiliate in Manchester, New Hampshire, will mark a year out from the first-in-the-nation New Hampshire primary with an hour-long special, "The Ones to Watch," highlighting 2020 contenders, at 7 p.m. The special will feature new interviews with Booker, Sen. Elizabeth Warren, former Housing and Urban Development Secretary Julian Castro, U.S. Rep. Eric Swalwell and others. The program will also be livestreamed at ABCNews.com/live. Former Rep. Beto O'Rourke will attend a rally in his hometown of El Paso, Texas, to counter Trump's appearance. It also begins at 7 p.m. MST.